Everybody is in a tizzy about the pie contest at this year’s county fair, especially DeeAnn. She’s a fabulous baker, of course, but she’s an outsider. She’s only lived here about 25-30 years. I’m not sure of exactly when she came to town. I've only just gotten to know her. But the point is, usually these contests are won by the local Mennonite women. I have to hand it to them, they are extraordinary bakers. I won it a few years—until I was disqualified for using alcohol in my pie. Yep. That’s right. This makes my French friend, Jon, very angry. But we live in Cumberland Creek, which is not only in the Bible Belt, but also surrounded by Mennonites. I think the rule is stupid and should change. But nobody cares what I think—well, at least about this one thing. The rule is ridiculous because when alcohol bakes, most of the alcohol evaporates and what’s left behind is that delicious, earthy, sensual flavor. The year I was disqualified, I had made an apple pie with bourbon. Oh Lawd, you never tasted such a delicious pie in your life! Nobody’s going to get drunk on a slice of apple pie with a bit of bourbon in it! Still, it went against the rules—created fifty years ago, by the by. Times are changing, I say. But until those that are in charge "get the message," I can’t be in the competition. I’m hatching a plan. Don’t know quite what I’ll do yet. Grin. 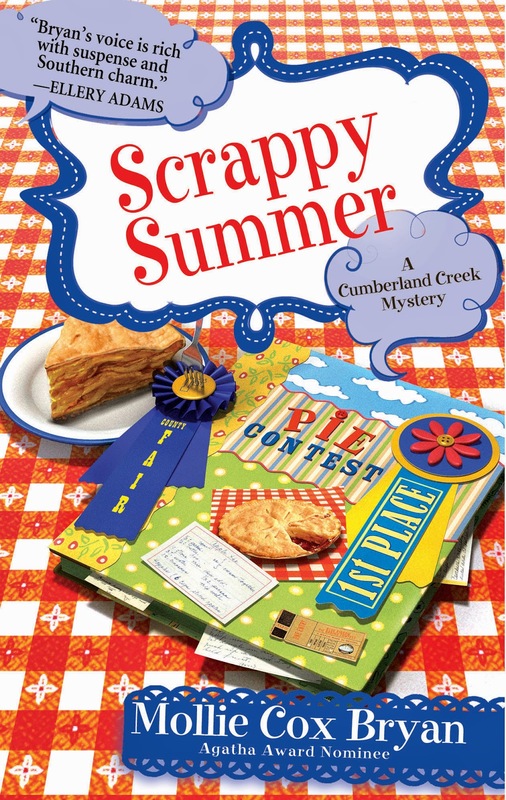 If you want to know more about the pie contest and how it turns out check out SCRAPPY SUMMER, which was released yesterday. Just sent you a copy! Thanks so much for your interest.